In 1877, the first student from China matriculated at MIT. By 1910, China was sending more students to MIT than any other foreign country. From these beginnings, the Institute became one of the most popular destinations for Chinese overseas students, many seeking to contribute to their country’s modernization through engineering, science, and commerce. Between 1877 and 1930, nearly 400 students from China attended MIT. These students played a key role in bringing new technology and science back to China during an era of rapid modernization, while also promoting American understanding of China and its people. Early Chinese graduates of MIT produced numerous inventions, from the world's first Chinese typewriter to the Model C training seaplane, and pioneered work in fields from microwave spectroscopy to nonlinear control theory. Many today stereotypically associate Chinese with STEM, but the early students had to fight skeptics who thought Chinese incapable of first-rate science and engineering. An upcoming exhibit at the Maihaugen Gallery, "China Comes to ‘Tech': 1877-1931," tells their story. 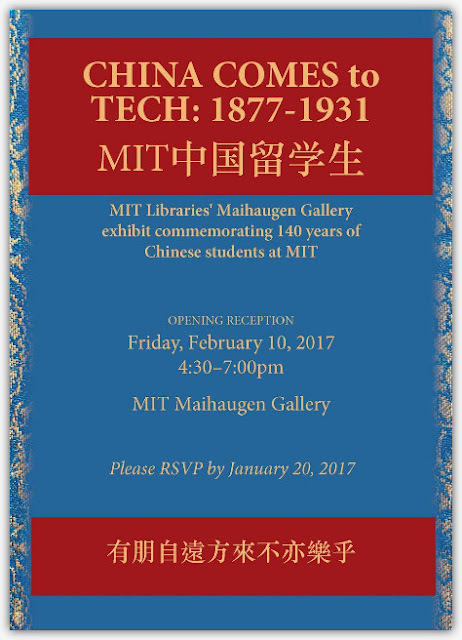 Inspired by the MIT Chinese Students’ Directory: For the Past 50 Years, published by the Chinese Students’ Club in 1931, the exhibit will open Feb. 10, 2017 to commemorate the 140th anniversary of Chinese students at MIT.